As the dust settles on the September 11th disaster in the United States, at the World Trade Center towers and the Pentagon, the role call of missing people grows daily, and it becomes more apparent how many lives these lost souls have touched. Every community, family, company, or group have suffered losses of one form or another, and rugby is no different. Clubs in the New York area are only now grasping the scope of their collective losses, and a special webpage has been created by Old Blue New York RFC honouring the memory of player's lost in these senseless and violent acts. We encourage our readers to share their grief and pass on condolences which we will post on our site over the next few days, and also ask you to visit the page for a moment of reflection. Mark Bingham -- San Francisco Fog -- Killed on Flt 93 which crashed in Pennsylvania. Look over the names and say a quick prayer to all those lost on September 11, including our rugby brothers. 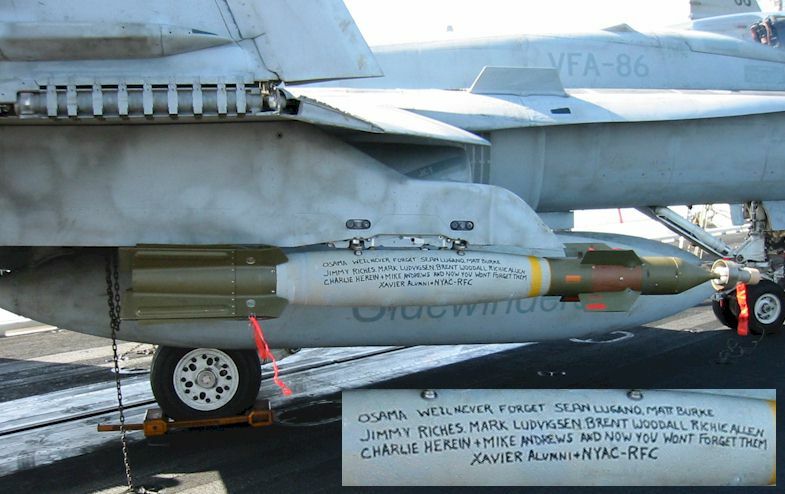 A little gift to Osama bin Laden from the U.S. Navy. September 13, 2001 - The news has started to trickle in as rugby clubs from around New York look for their missing members. Trade Center and managed to get out in time. However, retired player and former Old Blue captain Mike Stewart did not, and is still missing. "We're worried about the alums," said Levine. "We've got a lot of finance guys out there." New York Athletic Club suffered further. Club president Mark Ludvigsen was in the building and is missing, as is scrumhalf and 1995 All American Sean Lugano. NYAC's Brent Woodall, who also played tight end at Cal as well as AAA baseball, is also not accounted for. Lugano was also a former Xavier High School player, and Xavier has another alum (and also brother of NY RFC president Paul), Matt Burke, missing as well. John Truehart from New York RFC reports that Tommy Knox of North Jersey RFC and Nick Rowe of Manhattan RFC are also unaccounted for. "Our thoughts and prayers are with all of them," said Truehart. New York RFC did not report any missing from his club, and among those who have contacted Goff On Rugby is Eagle fullback Kurt Shuman, who works near the WTC, and reports he is fine. "We are just doing what we can now," said Old Blue's Levine. "You feel helpless now so we're working on a clothing drive together with the Morris women's team, which I coach. And we're working with the Red Cross to just do what we can." Mark Ludvigsen was five years old when his father bought him a rugby ball for Christmas. The gift sparked a passion that lasted a lifetime. "He got his selflessness from his mother and his love of rugby from me," says Karl Ludvigsen, who taught his son how to tackle on their front lawn in Rothesay, N.B., where he and his wife, Christina, raised Mark and his younger sister, Clare, before the family moved to Pottersville, N.J., in 1977. "He'd come running at me with the ball and hit me as hard as he could. Even then he could hit." Better known to teammates as Lud or Luddy, Mark was committed to rugby and the New York Athletic Club he'd played for since 1991. One of the team's top players, the 32-year-old also contributed to its success off the field. "It was amazing how much time he put into the club recruiting and taking care of new guys," says Michael Tolkin, 33, head coach of the amateur team that lost three players on Sept. 11. "In one case, he got a guy a job, took him out for dinners and let him stay at his house. He was the nicest guy there was." Tolkin says the club now wears jerseys emblazoned with the names of its fallen stars. At work, Ludvigsen had risen quickly as a bond broker at Keefe, Bruyette & Woods, recently becoming a senior vice-president. He lived with his wife of three years, Maureen, in Manhattan and planned to start a family soon. "He was the type of guy who'd have run back up two flights of stairs to help someone in a wheelchair get out of the building," says Karl. "He was just a wonderful son and friend." Todd Beamer told the GTE Airfone operator he knew he was going to die, asked her to pray with him and uttered his last, defiant words. "Are you guys ready?" the operator heard the 32-year-old Beamer ask fellow passengers aboard United Airlines Flight 93, which crashed into the Pennsylvania countryside 80 miles southeast of Pittsburgh on Tuesday. Then he said: "Let's roll." The operator, Lisa D. Jefferson, heard screams and a scuffle before the line went dead, according to Beamer's wife, Lisa, who heard the account from Jefferson. Lisa Beamer said Jefferson told her she was on the line in Chicago with Todd Beamer for the final 15 minutes of the flight, which was headed from Newark to San Francisco and crashed just after 10 a.m. The phone call, first reported yesterday by the Pittsburgh Post-Gazette, offers the most detailed evidence yet of the passenger revolt aboard Flight 93 that may have caused the plane to crash short of its intended target -- believed to be Washington. In other phone calls, two passengers told people on the ground they were planning to try to overpower the hijackers. New details also emerged yesterday about the final moments of the two hijacked airliners that slammed into the World Trade Center. United Flight 175, a Boeing 767 headed from Boston to Los Angeles, was on a collision course with at least two other airliners after it veered off course and descended toward Manhattan. In one case, the hijacker controlling the plane appeared to maneuver the flight to avoid a collision, according to government sources. Another aircraft descended rapidly after being warned of an imminent collision with a hijacked plane by the on-board collision warning system. As it flew toward Manhattan, United 175 turned to the left and began descending. One controller reported to investigators that he realized the plane had turned head-on toward a Delta aircraft, "and was descending into his face." The Delta plane began a turn, but the other aircraft also turned, and their radar targets merged on the screen, sources said. However, the hijacked plane leveled off for a moment, perhaps to avoid the Delta aircraft, then began its descent again. The hijacker pilot "knew what he was doing," a controller said. Shortly after that, the hijacked plane was headed straight for a US Airways flight. The US Airways plane's collision-avoidance system detected the approaching plane and advised the US Airways pilot to descend, which he did, averting a collision. Controllers scrambled to direct other planes out of the way of both United 175 and American Airlines Flight 11 -- which also originated in Boston -- as they headed toward the twin towers. Lisa Beamer said her husband called Jefferson on a GTE Airfone at 9:45 a.m., after the passengers aboard his flight had learned that Flight 11 hit the World Trade Center. By that time, the hijackers aboard Flight 93 had stabbed one passenger to death. The United pilots, Jason Dahl and Leroy Homer, had also been injured, Beamer told Jefferson, though he did not say how seriously. The remaining passengers and crew were broken up into two groups; some were herded together in the first-class compartment, but most were told to sit on the floor in a galley at the rear of the 757-200's 110-foot cabin, Beamer told Jefferson. Beamer said that he and a group of men in the rear of the plane planned to "jump on" one of the hijackers who was standing guard over them, with what he said was a bomb attached to his waist. "We're going to do something," Beamer, a father of two from Cranbury, N.J., told Jefferson. "I know I'm not going to get out of this." He asked Jefferson to recite the Lord's Prayer with him and she did, Lisa Beamer said. Beamer then said, "Let's roll," and Jefferson could hear chaos in the cabin until, minutes later, the line went dead. It was the hijackers' bad luck that they chose a plane with a number of large men on board. Beamer stood 6-foot-1 and weighed 200 pounds. Jeremy Glick, 31, another passenger involved in the apparent revolt, was a college rugby player and judo champion. Mark Bingham, 31, of San Francisco was a 6-foot-4 rugby player. United Airlines has told the family of passenger Lou Nacke, 42, a 5-foot-9, 200-pound executive who wore a "Superman" tattoo on his left shoulder, that Nacke is believed to have been involved in the plan, according to Robert Weisberg, Nacke's father-in-law. There was also a trained pilot among the passengers, Donald F. Greene, 52, executive vice president of Connecticut-based Safe Flight Instrument Corp. A person who answered the phone at Greene's home yesterday declined to comment. Even if they managed to overpower the hijacker standing guard over them, the men in the back of the aircraft would have had to run -- single file, down a narrow aisle about 37 yards to the cockpit. Both Beamer and Glick spoke of three hijackers in their phone calls, but the FBI has identified four, two of whom were apparently in the cockpit. This suggests that the passengers may not have been able to see a fourth hijacker. Todd Beamer was on the line for about 15 minutes -- long enough for him to ask Jefferson to relay a message to his wife and two sons, David, 3, and Drew, 1. "Tell her I love her and the boys," he told Jefferson. Lisa Beamer, 32, said she is expecting another child in January. She said her husband knew she was at home, but she believes he called the GTE operator to spare his wife pain and to get word of the hijacking to authorities. He gave Jefferson his home phone number and asked her to call. On Friday, Lisa Beamer finally spoke with Jefferson. "Now knowing there were a few people on board who showed that level of courage, it's just an inspiration to everybody when there's not a lot of inspiration to go around," Lisa Beamer said. The air traffic controllers on duty Tuesday morning in Boston, New York, Cleveland and Washington who watched the four doomed airliners on radar screens have now told their stories to investigators. Sources say these debriefings show the terrorists knew their commandeered aircraft well enough to use several electronic means to confuse controllers. Gradually, controllers sorted out what was happening, but to their horror, they could do nothing but watch. The FAA's Boston and New York "en route centers" -- where controllers guide planes through upper-altitude airspace and vast areas of lower airspace where there are no major airports -- saw almost all the action involving the two World Trade Center planes. The first real sign that something might be wrong apparently came when the Boston center gave American Flight 11 permission to climb but received no answer. There was no further radio contact with the plane. Controllers at both the Boston and New York centers were confused at first, but a New York controller announced: "I believe I might be working a hijack." According to sources, one of the first radio utterances from an open microphone on one of the two craft was, "Get out of here. Get out of here." Controllers lost track of American Flight 11 as it flew at 29,000 feet. Later, it was determined the pilot had probably turned off the plane's transponder, which sends controllers the plane's identity, flight number, altitude and speed. The New York center took over the task of locating the American 767, continuing to search south along the flight path the plane should have been taking. The first outside word that controllers received was that a small twin-engine plane had hit one tower of the World Trade Center. They thought it was a twin-engine Cessna that had taken off earlier from Poughkeepsie, N.Y., to fly south under "visual flight rules," meaning the plane was not under direct air traffic control. As several controllers gathered to help search for the American plane, a controller glanced at another radar screen and shouted, "Look. There's an intruder over Allentown." In air traffic jargon, an "intruder" is a plane with an operating transponder that has entered restricted airspace without permission. This time, the hijackers had tried a different tack, or perhaps made a mistake. Rather than turn off the transponder and leave controllers with little information, they turned it off for about 30 seconds, then retuned the transponder to a signal that was not designated to any plane on that day. A transponder must be tuned to a specific four-digit code, called a "squawk," that is programmed into air traffic computers. This allows the computer to identify the plane and display its information on radar screens. Whatever the hijackers were trying to accomplish, the bogus squawk allowed controllers to track the intruder easily, though they couldn't identify it. At that point, the facility chief said: "I think we may be dealing with two aircraft here." Then, as the plane began to dive at 6,000 feet per minute, a controller said: "No, he's not going to land. He's going in." (Berkeley, California) 20 November 2001 -- Rugby players and Flight 93 passengers Mark Bingham and Jeremy Glick will be honored during half-time of the upcoming USA-South Africa international match on December 1. In a special ceremony, the Bingham and Glick families will accept the inaugural James A. Baker III-USA Rugby Leadership Award, and NYPD Officer Daniel Rodriguez will perform his signature rendition of "God Bless America" for fans at the University of Houston's Robertson Stadium. Named for Houstonian James A. Baker III, a collegiate rugby player who went on to serve as Secretary of State and Secretary of the Treasury, the annual award will be presented to past and present rugby athletes who have achieved great distinction off the field of play, thus bringing honor to the sport. Award sponsor James A. Baker III said: "I am deeply honored to have my name on the award given to these courageous men, and I am glad we have this day to tell them and their families how much we appreciate what they did." Bingham and Glick, the two inaugural recipients, were each lifelong rugby enthusiasts who played at the university level. Both made poignant phone calls from the hijacked flight, Bingham calling his mother and Glick his wife. It is presumed that afterward they were among the leaders who took down Flight 93 over western Pennsylvania, preventing the plane from reaching its supposed target in Washington, D.C.
Bingham, 31, was a public relations professional and a founder of the San Francisco Fog Rugby Club. Previously, he played lock on national championship teams at the University of California, Berkeley, in the early 1990s. Glick, also 31, was an Internet executive and the father of a newborn daughter. He too played second row, at Rochester University, where he was also an NCAA Judo champion. Officer Rodriguez, who has garnered acclaim for his performances at public events since the September 11 terrorist attacks, will also sing the National Anthem prior to the game. This year's Baker Award is being underwritten by Conoco, which has already contributed $1.2 million to various September 11 relief agencies. Presented by Tullamore Dew Irish Whiskey, the USA-South Africa match has drawn a record number of rugby supporters from around the country to Houston and will also be televised live on Fox Sports World in the United States, as well as live in South Africa and the United Kingdom.